The Essentials of Bicycle Care! 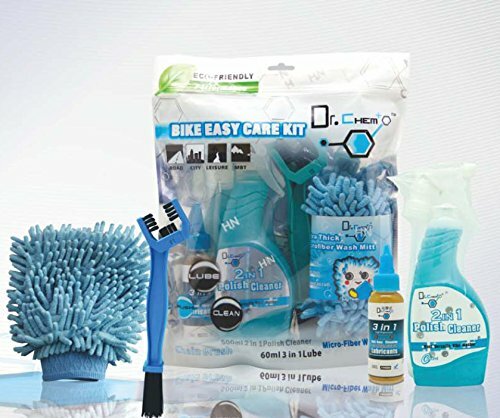 Our kit contains everything needed to quickly and easily clean every part on your bicycle. This Pro Bicycle Care Kit includes 4 essential items you'll need to care for your bike and protect your investment. A clean and lubed bike lasts longer, looks great, and rides smooth! This 4 piece kit allows you to do just that, easily and hassle-free. A perfect gift item, which includes the essentials of bike care for all seasoned and amateur bike enthusiasts. Includes 2in1 polish cleaner that allows you to not only wash off any grime on your bicycle but also leaves a nice, clean polish look once rinsing is complete. Also comes with micro-fiber wash mitt that can be used not only on the frame and handlebars but on the tires of the bike as well. To keep your bicycle's chain working at its peak performance, our heavy duty chain brush and 3in1 premium lube is also included in the kit. Our complete bicycle care kit is not only going to improve your bicycle's appearance but will also increase its performance, just like the first day you rode it. Compatible with all bikes: mountain, road, city, hybrid, BMX, folding, etc.